Floodplain and erosion hazard codes are intended to protect public health and safety by regulating development in areas subject to inundation by a flood; typically a 100-year flood event. Compliance with federal law requires that the local regulatory agency conduct studies and submit floodplain maps to the Federal Emergency Management Agency (FEMA) in order for the information to be incorporated onto the FEMA Flood Insurance Rate Maps (FIRM). Developments in these mapped areas must obtain federal flood insurance. Communities may also designate locally regulated floodplains and institute erosion hazard setbacks where certain construction standards are required, such as riprap, concrete scour protection, and elevated building pads and utilities. 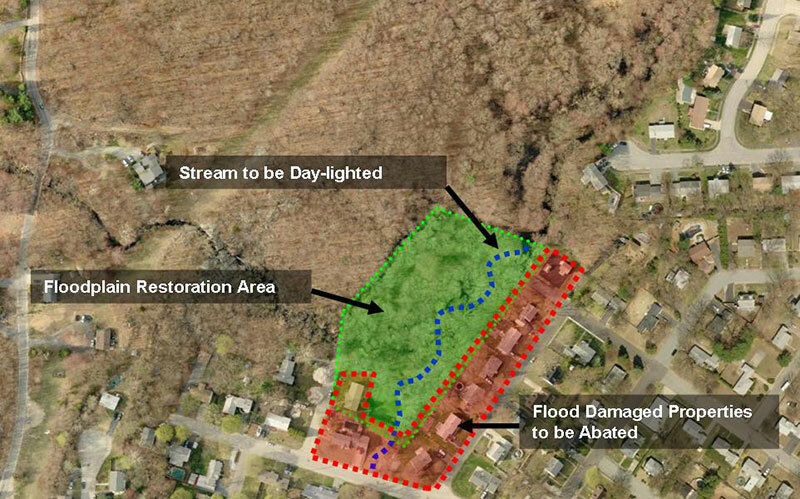 Aerial view of a floodplain area with damaged properties requiring remediation, and identifying the floodplain restoration area. Photo credit: USDA NRCS. Floodplains are dynamic natural systems that change over time in response to flooding and deposition of sediment. Benefits of adopting codes to restrict development in floodplains are that they reduce the risk and impact of flooding, reduce disturbance to natural drainage systems that have developed over time and naturally control flooding and erosion, preserve open space, and reduce potential new impermeable surfaces (roads and buildings) that increase runoff and erosion. Moving development away from watercourses protects floodplains, which absorb water that supports groundwater recharge, growth of native and cultivated plants, habitat for wildlife, and can offer recreational opportunities. Communities can also define and use floodplain and erosion hazard designations to protect and regulate significant “listed” watercourses, which may or may not have riparian habitat. Significant watercourses can be delineated in stormwater management plans and other studies, and protection of watercourses can be specified in policy documents and comprehensive plans. The City of Tucson has adopted a number of policies, codes, and standards since the early 1980s to protect riparian vegetation along the City’s watercourses. These changes have been partly in response to public expectations about vegetation protection, which has increased over the years. In 2006, the City adopted Development Standard 9-06 to consolidate sections of the Tucson Code that address watercourse protection into one document. This provided a single application review process that was intended to help property owners and developers better understand the regulations. Sections that were consolidated are from codes regulating the following: 1) Floodplain and Erosion Hazard Management, 2) the Environmental Resource Zone (ERZ), and 3) Watercourse Amenities, Safety and Habitat (WASH). The Floodplain and Erosion Hazard Management Code states that development within the 100-year floodplain and erosion hazard area may not unnecessarily alter riparian habitat along the watercourse and its banks. “Necessary” alteration of habitat must be demonstrated by developers, given the many land use scenarios and configurations allowed under current or proposed zoning. Any necessary habitat disturbance must be mitigated pursuant to the WASH Regulations. The ERZ is an overlay zone that was adopted to preserve open space and critical riparian habitat on properties shown on ERZ overlay maps within the 100-year floodplain. Any development that encroaches into the floodplain requires a Resource Corridor Study and, if disturbance will occur, a mitigation plan. The WASH Regulations are intended to protect existing vegetation in “resource areas” along specific washes listed in the WASH code, to provide for the restoration of vegetation along disturbed wash reaches, and to aid groundwater recharge. Resource areas consist of wildlife habitat and vegetative resources within the wash banks and extend 50 feet from either side of the banks. Proposed development requires an inventory of the vegetative resources and wildlife habitat within the resource area. The WASH Regulations specify criteria for demonstrating why the resource area cannot be left undisturbed, as well as criteria for the mitigation plan required for any site disturbance. Riparian Buffer Protection: A Municipal Ordinance Perspective provides a general overview of items to be considered in drafting an ordinance.